My Firefox upgraded this morning to version 3.6.13, and I've noticed a number of striking differences; I'm wondering if it is me, or if the site has somehow also changed coincidentally at the same time. This morning, I've been having some trouble with very slow processing of math text (text within dollar signs), taking up to a minute to occur, and the look of the math text has changed considerably from the way it looked yesterday. 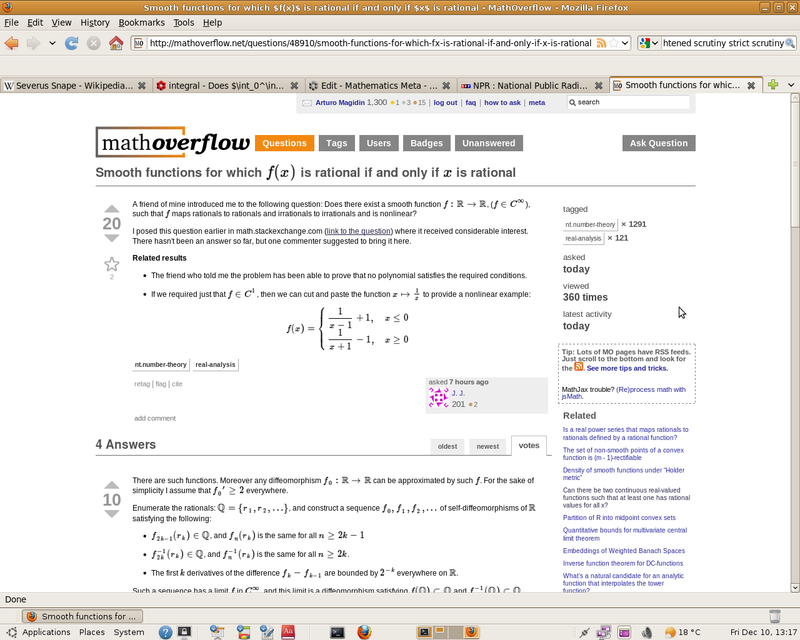 (Added: I note that the math fonts in MathOverflow still look the same as they did yesterday). Added: When processing after a reload or hard-refresh, it ends saying in a little box on the bottom left "can't load web font TeX/Math/Italic". I'm running on Ubuntu 10.04. 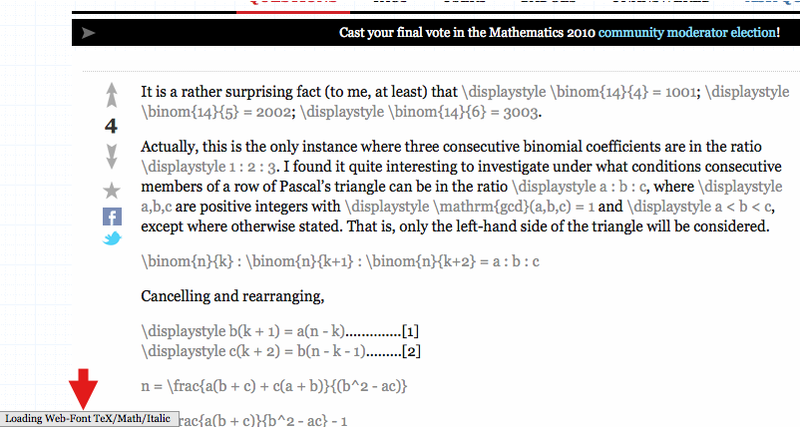 UPDATE: I followed the link to the MathJax page for font help, downloaded the STIX fonts and installed them locally. That seems to have solved both the time and the display problems. So it seems clear that the problem was that somehow I was not able to load the web-based fonts. UPDATE 12/12.2010: It seems that the MathJax folks have fixed the problem on their end. I uninstalled the local fonts in my Windows machine and everything seems to work fine now; I'll try it in my Ubuntu machine tomorrow. New OTF font files have been downloaded and applied to all installations where MathJax is used. If you are still having trouble clear your browser cache. 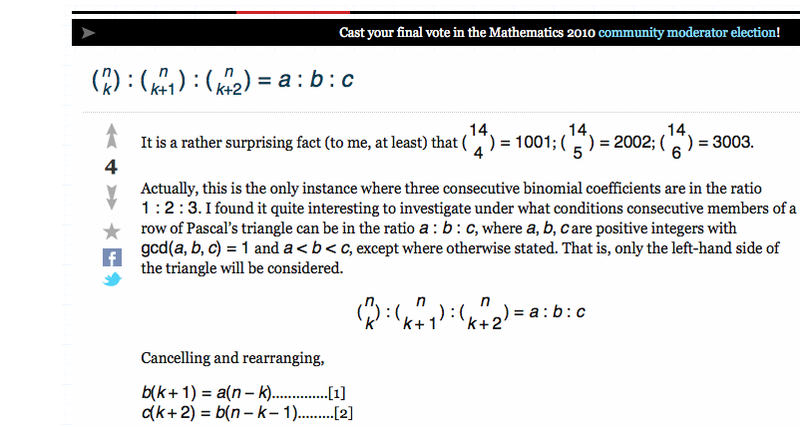 Davide and Sean were able to update the MathJax fonts, and we just posted an update at mathjax.org. 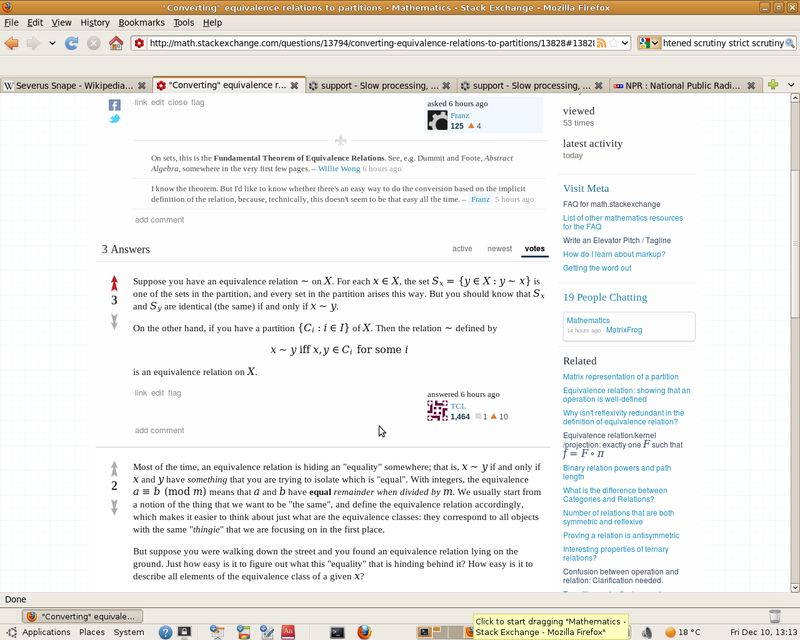 See http://www.mathjax.org/download. Davide also updates the fonts.zip file in our github repo and in the SourceForge SVN rep. The only difference is the updates for Firefox, so if you get the above patch file, you don't need to download the whole fonts.zip. It appears that members of the MathJax team are aware of this and are working on a fix. OK, I've looked into it, and it seems this is not going to be easy to fix (it is going to take more exploring than I have time for at the moment). On the other had, I do have an interim solution: it seems that FF is unhappy with the OTF versions of the fonts, but it is able to load TTF versions. We don't currently have them in the fonts distribution, but I do make them (as part of the creation of EOT versions), and these do seem to work with FF4.0b as well as 3.6.13. It is a straightforward change to include the TTF versions and have FF use them for v3.6.13 and above. (Do we know that this is the version where it came into play?) So there is at least a solution. I will still work on figuring out what is wrong with the fonts and how to fix it, but I'm not really a font expert, and it takes me a while to work through it. Open about:config in the adress bar in Firefox. I just upgraded my Firefox from 3.6.12 to 3.6.13(Mac OSX 10.5.8). I'm able to reproduce the problem. It seems it takes FF forever to load the math font. But eventually the font does get loaded. However I noticed the font is now a sans-serif type. Where as before, and currently in other browerser it is(and should be) a serif type. I'll look into this. I suspect this isn't an isolated issue with Math.SE. Seems like a FF 3.6.13 issue. 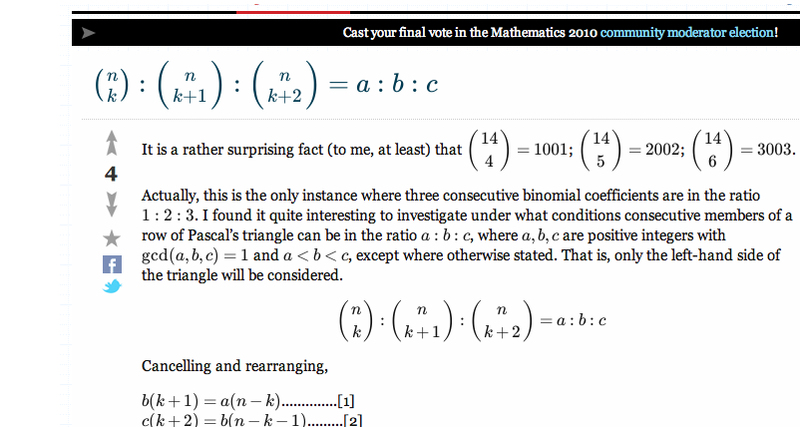 I wonder if other sites that use mathjax are affected as well? Not the answer you're looking for? 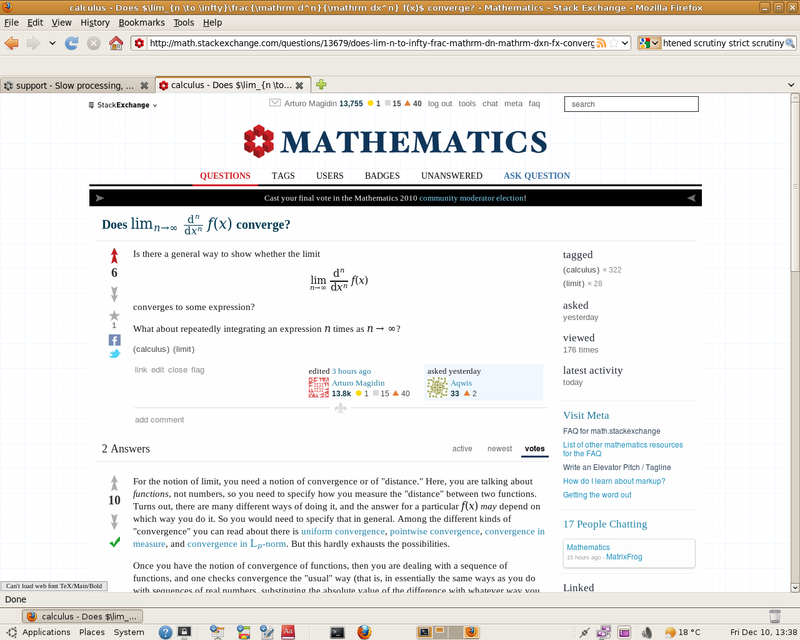 Browse other questions tagged support status-completed mathjax user-interface .